The primary reason people go for garage conversions is to make available the underused floor space. 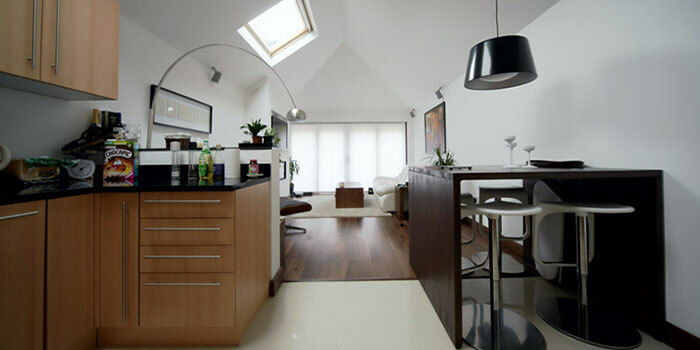 At NÜHAUS, we know the ins and outs of renovations and garage conversion like few other construction companies in Dublin. Where you bought a house in a housing society or from a previous owner, you might realize that the garage your house has is unnecessarily spacious. Very little of the space in the garage is actually used for parking your cars. The rest gradually becomes littered with all kinds of rubbish that you have nowhere else to store in. This underused space can be used in a number of other ways. At NÜHAUS, we offer a large number of options to you for garage conversion. Very few homeowners realize that converting garage into an useful space can dramatically increase the resale value of your house. So, if you want to use optimum space while adding to the resale value of your property, garage conversion service from NÜHAUS is the best fit for you and your house. With NÜHAUS, you get not only construction services but you also get our architectural and design services. Our team of expert designers will prepare detailed plans after consulting you. Once the plans are finalized, our construction teams will take over and see the job through. For projects involving garage conversion, Dublin authorities don’t require specific planning permissions, so long as the project is indoors. However, depending upon various cases, other clearances and permissions are often required. That said, with NÜHAUS, you don’t have to worry about any of the construction permits, either. We maintain a great working relationship with local authorities to acquire all the requisite permissions on your behalf. This means legal, proper and safe construction that matches your vision! So, if you are a homeowner in Dublin and looking for a garage conversion service provider, look no further than NÜHAUS! Call NÜHAUS experts on 01 440 2285 or get in touch with our design experts to discuss your garage conversion ideas. To know more about people behind NÜHAUS.